It is very common to use small pieces of sliced Iberian ham and boiled eggs as toppings to add some extra flavor to your Salmorejo so do not hesitate to add them just before serving it. Once you have bought all the ingredients, you are ready to start. Keep calm, the recipe is very easy to cook and it will be delicious. Wash the tomatoes and cut them in four pieces. Place the tomatoes in the blender and blend for two minutes (aprx) at a high speed until smooth. Add the break (previously cut in small pieces) and the garlic and leave them soaking with the tomatoes just for few minutes before start blending the whole mixture. Add the teaspoon of salt and keep blending until the mixture gets a smooth texture. Serve it cold with or without the toppings mentioned above (small pieces of Iberian ham and boiled eggs) and enjoy it! Spring and summer times are the ideal seasons! 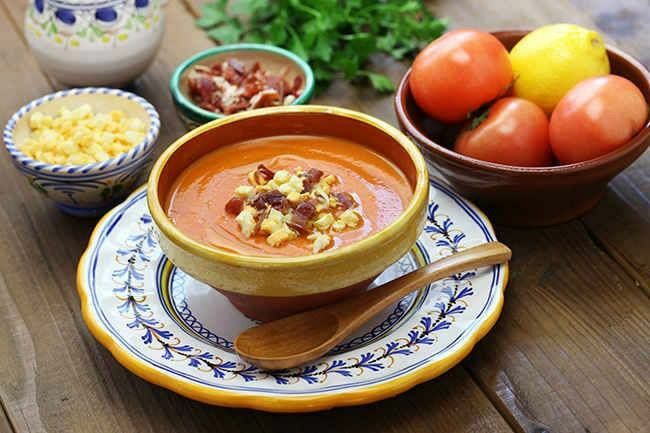 In the warm and hot weather is just so refreshing and healthy having a home made salmorejo as a starter or aperitif. It is the classical tapa to try at a local bar in Córdoba over lunch time! We would like to challenge you and see your recipes. Please, send us your photos to info@just-explore.com and we will post them on Instagram.